And, to date, nine small and medium-sized companies have been, or are being, helped to grow in the industry through collaboration between ourselves, the East Midlands Development Agency (EMDA) and EMDA’s agent, Transport iNet. We have also carried out a study for EMDA on inward investment opportunities in the industry. The company brings a great deal of energy, enthusiasm and practicality to the party. 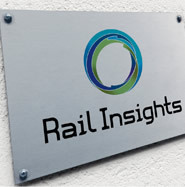 We are also exceptionally knowledgeable, especially about the rail sector, as evidenced by our across-the-board senior management experience in operations, infrastructure and rolling stock. This, together with our excellent connections, sets us well apart from our competitors. Our preferred style of working, whether in the rail or any other sector, is collaborative. We like to think of ourselves as taking a quasi non-executive director’s role in your business. It’s important for us (and you) that we are accepted as one of your team, supporting and challenging in equal measure. The closer the relationship the more effective we will be. Finally, we are excellent value for money.